Once endowed with a ritual function, customs still are a specific way of communicating in the village world. Moreover, they help consolidate the relations within the community. Certain customs, spectacular in character, have made their way into the city. 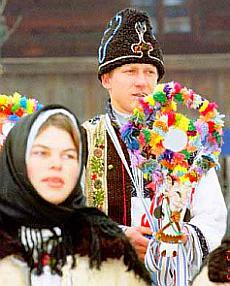 The major customs are related to calendar events or the rites of passage. The former belong to the whole community, combining Christian significances with elements of old agrarian rituals. Though revolving around Christmas, the winter holidays, for instance, also include customs recalling the celebration of winter solstice. This is a moment of magic brightness, when people rejoice at the fruit of the year drawing to an end and express confidence in the New Year.